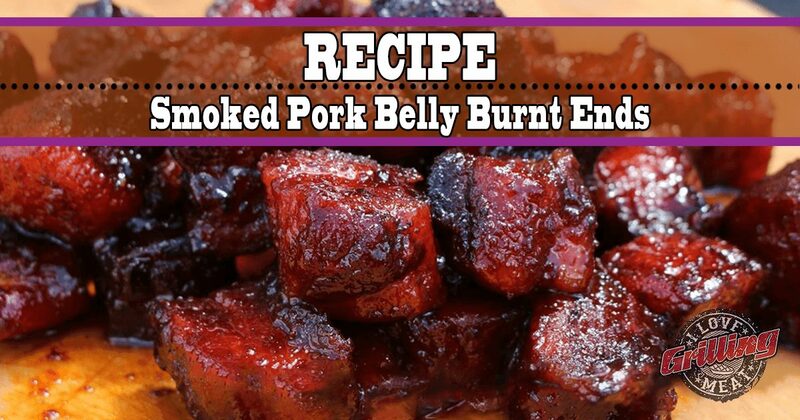 Try these pork belly burnt ends and your family will certainly give you mouthwatering thank you’s many times over. So if you’re looking for a tasty game day treat that you can make on your smoker, you’re in the right place. Most people think of brisket when they hear “burnt ends” – but what if you could have the same thing taste like pork? Enter Pork Belly Burnt Ends. The pork belly packs a ton of great flavor (it is, after all, where bacon comes from!) so it is the best candidate for burnt ends. Start with a skin-off pork belly, and cut it into 1 1/2 inch cubes. Keep in mind that, like all meat, the cubes will lose some of their size while cooking, so you want to cut them a bit oversized to account for that. Next, cover the cubes in a good layer of BBQ rub. You can use any rub you like – use a basic rub, your home blend, or one of the fancier ones that are sold out there. Then you’re going to set your smoker up for smoking the pork belly burnt ends indirectly, somewhere in the 250ºF-275ºF range and add a couple of cherry (or other fruit wood) for smoke. Place all of the burnt ends on a cooking rack, without them actually touching, so they can develop a bark. Place the burnt ends on the smoker to cook over indirect heat. Smoke for 2 – 2 1/2 hours. Then pull of the smoker, and move the burnt ends to a disposable aluminium pan. Get 1 cup of brown sugar, a good drizzle of honey, and 1 stick of butter (cut in to pieces) and spread them over the pork belly burnt ends. Cover the pan with some foil and place back on the smoker for another hour or until they become tender. Once you have tenderized your burnt ends, move them over to a new pan, and toss with your favorite BBQ pork glaze. Place back on the smoker for 5 more minutes to caramelize the sauce. Finally, simply serve on a platter alongside some sauce, and have everyone asking for more! I do not have a smoker but used a weber grill and due to time restraints could not finish this recipe in one day. FYI-there is a story there by the way. Anyway, I used the smake method on the grill, a few piecies of pecan wood along with a mix blend of pellets in a smoker tube. I was unable to keep the temp at the 275 degrees and went up to 325 at times. Had the ends on the grill for 3 hours then 1 hour covered. This morning I finished the process in the oven with another 1-1/2 hours at 275 and then added BBQ sauce and back in the over for 20 minutes. I can’t imagine how good this recipe would be if done on an actual smoker but I can tell you it is everybit as good as Malcom siad it was in the video. The pork belly burnt ends are “Holy crap this is good, kind a good”! Thanks for the recipe!